For nearly two decades I have umpired. I have sat in classrooms and stood on fields at camps with hundreds of umpires. I have conversed on social media and discussed baseball rules with countless umpires. 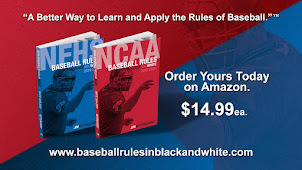 I have published books about baseball rules for umpires. You could say that I know a few things about umpires and officiating, but I am always continuing to learn. Most umpires working upper level ball got there by hard work but more importantly by being open minded to listening and learning. Umpires willing to consider a perspective that may be different from their own become better umpires and move up. Being closed minded and limiting your resources stops the ability to learn and improve. On the field an umpire's judgement and opinion are final. Umpires are not this way to be pious or hardheaded, but rather because it is the only way to correctly manage a game of baseball. While this is the best way to manage a game, it can be a barrier when it comes to umpires learning and improving. For the majority of all other umpires with an open mind and a desire to consider other perspectives, your best days of umpiring are ahead of you. The rest of you might consider giving your final judgments and opinions a day off. Who knows you might just learn to manage better without them. Let's Play by the Rules?